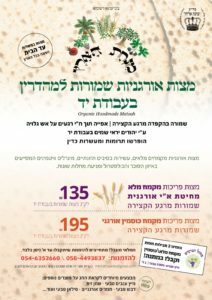 No deliveries on Chol Hamoed, so you will not be receiving your vegetables on Monday, April 22 and Wednesday, April 24. But… if the vegetables don’t come to you, you can come to them! On Wednesday, April 24, don’t miss our traditional Pesach Open Day in the field between 2pm-6pm. Stay tuned for more details, coming soon. There are years when the arrival of springtime is not a cause for celebration. When it follows a dry winter and we realize that this is it – the rainy season is over – we welcome spring with apprehension. Sadly, I’ve faced this haunting experience more than once in my life as a farmer: disappointment with the lack of precipitation in the previous winter and an acceptance of the spring season with a hopeful-but-heavy-heart. There are those who claim that the word aviv derives from the word av, meaning father, the head of the family, the first in the family, denoting the very first ear of grain during the period of ripening. Others believe that the origin of the word comes from a different meaning of av – a fresh, young plant which is presently blossoming, such as ibei ha-nachal, the “green plants of the valley” mentioned in the Song of Songs, (6:11) and “odenu be’ibo,” (whilst still in its greenness), Job 5:12. Shepherds also celebrated at Pesach. 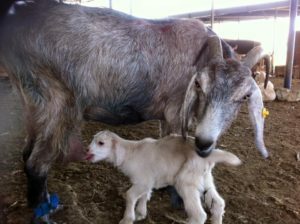 A wet winter of rich pastures led to a season of birth for lambs and goats and an abundance of milk, labeneh, cheese and butter. Can you think of a better reason to hold a celebratory feast thanking the Almighty for having endured the winter, and to pray that the entire herd grazes safely and peacefully? To this day, Bedouin shepherds dedicate the first butter of the season to Moch’an, the patriarch of nomadic shepherds. Once milking season arrives, they use a leather pouch to collect the butter made from milk produced during the first three days. On the third day, they prepare a great feast in honor of Moch’an, highlighted by a delicious taste of their brand-new butter. During this period, beekeepers rev up for their busy season of extracting the honey from the nectar gathered during the flowering from winter till now. We, too, eagerly await this season of honey gathering leading up to the heavenly final product – sweet, natural honey from the apiaries at Ein Harod and the Golan Heights. 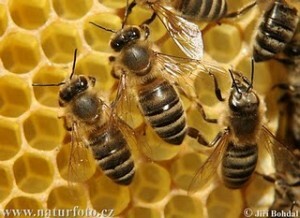 In nature, breeding occurs during springtime, as one swarm gives life to another. During swarm preparation, the bee scouts set out in search of a nearby location for the swarm to colonize and embark on their new lives. At this stage, they are very exposed and vulnerable. Unfortunately, this time of year coincides with Pesach cleaning which leads us to places that are usually less-than-accessible. And thus, we’ll be merrily cleaning away when suddenly we’re face to face with a young bee swarm on the wall, in a hidden corner of the garden or in the window box. And no, not everyone is happy to coexist with bees, which is why the Magen Dvorim Adom organization was established. This volunteer bee rescue squad arrives at the site to skillfully transfer the swarm to a safe place, allowing the bees to survive and continue to play their crucial role in global existence. Learn more about the organization here (Hebrew). 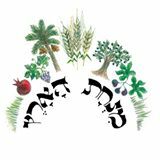 Pesach, the festival of spring, ushers in the parade of agricultural holidays in Eretz Yisrael, as Nissan opens the Hebrew calendar. During this festival, farmers are happily fortified with strength that’s been restored through many hours of sleep accumulated over the slow winter season (as their memories dimmed of last summer’s scorching heat…). We join in the hope and prayers that this holiday and this coming season will be blessed with honey, milk and the fruit of the land, which will bring health, peace and happiness. Chag sameach! See you at the Open Day! WHAT’S IN THIS WEEK’S HOLIDAY BOXES? Monday: Beets/zucchini, carrots, lettuce, potatoes, cucumbers, tomatoes, cauliflower/cabbage, kale/Swiss chard, parsley root/celeriac, fresh fava beans, parsley/coriander/dill. 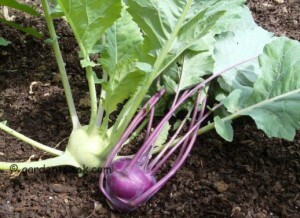 Large box, in addition: Baby radishes/turnips, fennel/kohlrabi, green garlic/leeks. FRUIT BOXES: Clementinot, oranges, bananas, apples. Wednesday: Beets/zucchini, carrots, lettuce, potatoes, cucumbers, tomatoes, cauliflower/cabbage, kale/Swiss chard, parsley root/celeriac, fennel/kohlrabi, parsley/coriander/dill. Large box, in addition: Baby radishes/turnips, fresh fava beans ,green garlic/leeks. On Wednesday, April 24, don’t miss our traditional Pesach Open Day in the field between 2pm-6pm. Stay tuned for more details! Many of the excellent products available through our Order System to be added to your boxes are Kosher for Pesach, including: honey, olive oil, spices, dates, tahi-na, date honey, gluten-free crackers and even some of Dani and Galit’s cookies. Contact us for further details. When I tell my daughters this story, I usually end it by saying: this is what family is all about. Composed of people who are different from one another, each with his or her own way to live their lives and with their own unique perspectives. And hey, there’s room for everyone! In the family I come from, similar to the family I have raised with my partner, we each have very different opinions and traits, preferences and choices (including politics, of course). Obviously, this diversity is not always simple and demands patience and flexibility (specifically during elections….) but that’s the general idea – always keep your door and heart open to family. Throughout this lavish winter, we have enjoyed many a visit from many a member of Chubeza’s winter royalty: the Brasiccae’s. This diverse family runs the gamut of preferences and developments in plants: leaves, flower buds, and thickened stems. They all need fertile and fertilized earth, and in return they provide us with a heaping portion of health, nutrition and flavor. 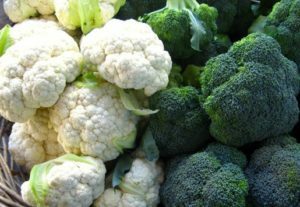 Not to mention beauty: take the cauliflower for example, with it shining white crown, or a purple or green rain-dotted head of cabbage, or Brussel sprouts which seem to be crawling up the stem to reach the top. This stunning pluralistic diversity is heartwarming – look at this family accepting each and every variation and tendency, manner of development, characteristic colors and precise flavor. 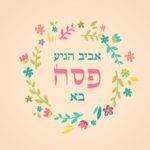 With Pesach celebrations upon us as we gather with our own varied family members, the Brasiccae family is worth a thought or two. Granted, this branched-out developing took some time, during which each member of the family found the right rhythm to beat to. This happened mainly thanks to the curiosity and self-confidence of loyal farmers, during times when everything was much slower and patience was abundant (what other choice did they have?). Changes and developments were achieved by hard work and sweat of the brow, which perhaps led to a fuller, more significant satisfaction with the positive results. Today’s pace of change and discovery is much swifter than it once was, but even in the distant, primitive past, farmers constantly refined their crops. Actually, many of the most amazing changes in species development came not as a result of structured research, but rather out of the simple act of a farmer choosing and collecting seeds from the plants s/he favored over seeds from less-desired plants. This straightforward action of promoting one plant over another had a huge effect on the improvement and change of a specific harvest or species. Long before wo/man understood the genetics of plants, their actions brought about small, slow variations in the crops, which compounded over time until they generated visible results. Over the past thousand years, wo/man also developed a passion for the undeveloped flower buds of the cabbage, and chose the plants that produced large-bloom heads. This is how we got cauliflower and broccoli, both different variations of an undeveloped cabbage plant. Cauliflower is var. botrytis, meaning “cluster,” for its resemblance to a cluster of grapes. Broccoli, which was developed in Italy, earned the title var. italica. In summary, this long, winding familial tale demonstrates that without a systematic education in genetics or plant propagation, but via a simple process of seed selection and a lot of patience, more than six distinctive vegetables have developed over the past 7000 years. Small, everyday miracles. They happen in the best of families. I buy fresh garlic from Mahmud in Machane Yehuda, and he recommended I grind the green garlic leaves in a food processor with a metal blade, after removing the external and harder leaves. Add fresh lemon juice and a generous amount of olive oil. You can then freeze the mixture in small cubes or containers and defrost when desired. It’s perfect for cooking or baking fish and can be used with meat as a chimichurri-like spread. Wishing us all a week of respect and concern for all members of Israeli society, in all their wonder and diversity. WHAT’S IN THIS WEEK’S BOXES? Monday: Beets/baby radishes, green garlic/leeks, lettuce, potatoes, cucumbers, tomatoes, cauliflower, kale/Swiss chard/chubeza (mallow)greens, parsley root/celeriac, fresh fava beans/peas, parsley/coriander/dill. FRUIT BOXES: Bananas, avocadoes, Clementinot, apples. Wednesday: Beets, green garlic/leeks, potatoes, cucumbers, tomatoes, cauliflower, kale/Swiss chard/chubeza (mallow)greens, parsley root/celeriac, carrots, fresh fava beans, parsley/coriander/lettuce. The matzot are shmurot from the time of reaping and hand-baked for 18 minutes. Orders may be made by email (chubeza@gmail.com) or SMS (054-6535980) until the end of the week only! 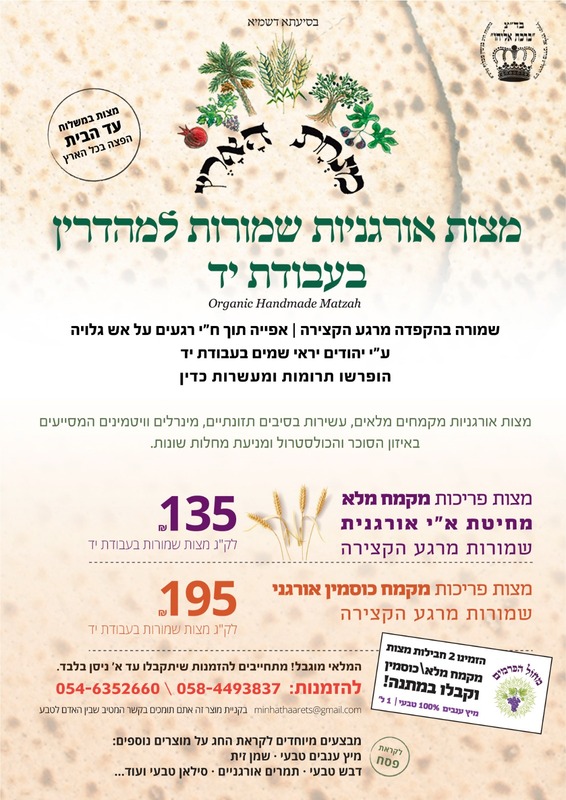 No deliveries on Chol Hamoed, so you will not be receiving your vegetables on Monday, April 22 and Wednesday, April 24. But… if the vegetables don’t come to you, it’s time to come to them! On Wednesday, April 24, we invite you to our traditional Open Day in the field between 2pm-6pm. Stay tuned for more details! Spring-like weather is just what the fava beans ordered to produce bountiful yields, fill our harvest buckets and your boxes. This member of the venerable legume family, whose chubby green pods are covered with a soft, cottony lining, has been gracing you with his presence for some time now. And because he is an infrequent guest, we make it our business to tell you a little about him whenever he drops in for a visit. Dry and fresh fava beans have been consumed in the Middle East and in North and South Africa for thousands of years. Fava fossils have even been found in in Middle East archeological sites from as early as 6500 BC (in our very own Nazareth)! It served as an important, essential food for all classes. 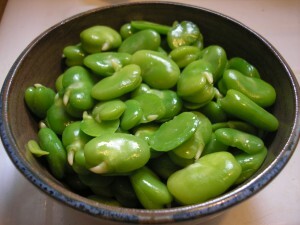 Fava is rich in protein, complex carbohydrates, and dietary fibers. 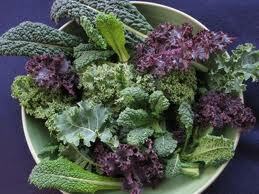 It contains a good amount of iron, folic acid, potassium, magnesium and zinc. And yet, “Stay away from fava!” cautioned Pythagoras. What did the renowned sixth century BC Greek philosopher have against one of the most popular vegetables of the time? Pythagoras aficionados and interpreters have offered many suggestions for this sharp warning. One is that fava is hard to digest, said to be “full of spirit, and takes a part of your soul, and if you stay away from it your belly will be less loud and your dreams calmer.” Despite this unflattering critique, one should not forget that fava contains less sugar and other hard-to-digest fibers than its fellow legumes, such as the green bean. Another possible reason for Pythagoras to disqualify the fava could have been the ancient belief that the spirits of the dead wander into the fava’s buds, making it a popular dish for funeral meals. Possibly the connection between the fava and the afterworld has to do with the fava allergy, also known as Favism (from the Latin Vicia faba). This allergy is extremely serious, deriving from a genetic deficiency in the G6PD enzyme, and commonly affects populations from the Middle East and Mediterranean (in Israel, it is most prevalent among Iraqi Jews). Fava consumption among some 20% of humans lacking this enzyme can result in acute anemia and even death. On the other hand, the fava appears to possess chemical components similar to those in quinine medicines used to treat malaria, a once-common disease in Greece and southern Italy. It seems that when the fava-allergy anemia is under control, it fights malaria by reducing the amount of oxygen within red blood cells, thus halting its spread. Another reason why fava should be part of our natural medicine chest is to treat Parkinson’s Disease. Fava naturally contains the L-Dopa amino acid, which becomes the Dopamine neurotransmitter upon reaching the brain. This acts to improve the condition of Parkinson sufferers, a disease resulting from Dopamine deficiency. Even 250 grams of cooked fava has proven to significantly boost the level of Dopamine in the blood, improving the patient’s condition. 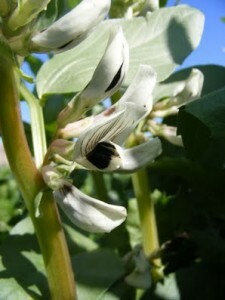 The largest concentration of L-Dopa is in fresh fava and its pods. Dry fava contains much less. Research is still in the early stages, and those considering fava for treating Parkinson’s should consult with their physician. In our part of the world, there are two varieties of fava – the larger Cypriot and the smaller Egyptian fava, which is almost the size of a pea pod. During Chubeza’s first years, we grew both varieties, but then we met an “in-between” type with medium-sized pods, which we now happily grow. In Egypt, fava is called “Ful Hamam” for a fascinating reason: in medieval times, preparation of the fava was carried out exclusively by those who lived in the area surrounding “the Princess Baths,” the public baths at the site of the Fountain of Mohammed Ali Pasha in Cairo. By day, the water in the great basins was heated for bathing. By night, when the burning coals were still ablaze, the great basins were filled with fava beans which cooked overnight on the coals to provide breakfast for the residents of Cairo. The fava’s tale began last autumn. There is something beautiful about it, something that returns us in our world of endless possibilities to the restraints of seasons and time and to slower, softer rhythms of life. We seed the fava at the end of autumn from September to December in four rounds, every month or so. We try to bury it deep in the earth before the first showers fall, when the skies above begin clouding over, informing us of an impending drizzle. On one hand, we want to avoid watering, but if we seed too early, we’ll lose our crop to the field animals stocking up at that very moment on food for the winter. The raindrops cover the fava with earth, greeting with fanfare the big, familiar seeds that they knew and loved last year. This encounter results in quick germination of the fava, which courageously bursts forth and continues growing even as the winter grows colder and rainier and the rest of the world withdraws into itself. The growth is slow and calculated. 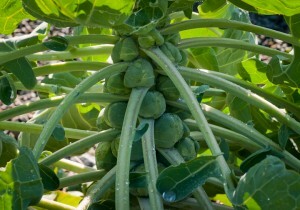 Fava takes its time, growing over an entire winter, patiently and steadily, inching a little taller every week. 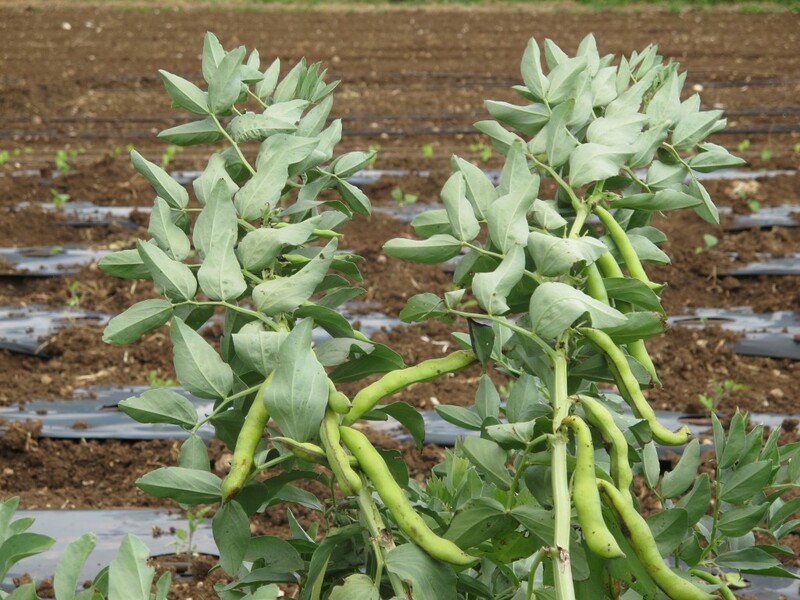 Favas cover the earth and protect the soil from erosion and the ravages of strong rains. It grows densely, preventing weed growth. 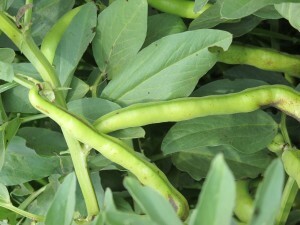 Favas do not require fertilizer, for like the rest of the legume family, fava beans can fix nitrogen for a do-it-yourself fertilizer, enriching the earth within which they grow. After months of rain, wind and cold, the fava feels something moving inside. Its faultless plant instinct senses the seasons changing, the days growing longer, the changing light, the sun’s locale, and then it knows – it’s show time! The fava debuts with beautiful fabacaea butterfly-like flowers. They are gentle and strong at once, like the fava itself. In strident pastel festivity, they overtake the garden beds as if to say, we’re all clean and dressed up and something wonderful is about to happen. Even when the fava blooms, it takes its time. Why hurry when you can look around, smell the fava, and enjoy life? The fava bed still looks like it stopped at the flowering stage, while on the surface nothing else has changed. But slowly, almost imperceptibly, a small green boat appears in the flower. This boat will thicken and fatten up until it becomes a seed-carrying pod. We pick them before they fully ripen and dry, when they’re still green, fresh, sweet and juicy. And that’s when we know spring is nearly here. Right here, in our field, in your plate. There are many ways to prepare fresh favas, and despite the suggestion to peel the fava bean (double peel), you can certainly cook and eat fava beans within their pods! – Cook in unsalted water (similar to blanching peas–the salt hardens the skin). – Steam in water and olive oil, or sauté onion and garlic, then add fava, boiling water, and lemon juice. Cook for 15 minutes till liquid is absorbed. – Fava may also be baked slowly in the oven on low heat, together with garlic and such fresh herbs as rosemary, thyme or za’atar on a lightly olive-oiled baking sheet. When the fava is very soft, crush together with the garlic and herbs and spread on bread. But I must admit, though the recipes sound great, I usually don’t get around to preparing them. In our house, the fava is eaten fresh, like peas, popped out of the pods and joyfully devoured, fresh and raw. Monday: Beets/baby radishes, fresh garlic/ leeks, lettuce, potatoes, cucumbers, tomatoes, cabbage/cauliflower, peas/bell peppers/zucchini, parsley root/celeriac, fresh fava beans, parsley/coriander/dill. Large box, in addition: Kohlrabi/carrots, kale/Swiss chard/chubeza (mallow)greens, fresh onions. FRUIT BOXES: Clementinot. bananas, oranges, avocadoes. Wednesday: Beets/baby radishes, fresh garlic, lettuce, potatoes, cucumbers, tomatoes, zucchini, parsley root/celeriac, fresh fava beans, coriander/dill, kale/Swiss chard/chubeza (mallow)greens. 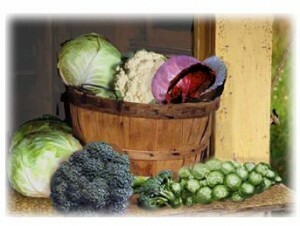 Large box, in addition: Cabbage/cauliflower, peas/bell peppers/carrots, fresh onions/leeks. We’d like to share with you some of the processes we are undergoing – never-ending processes, if you ask us – which occur naturally when one works with raw materials that have independent lives of their own! We constantly make alterations and adjustments based on our Golden Rule to serve customers tasty, aesthetic, nutritious food, handmade from products we ourselves choose and love. The kind you can taste and feel good about right away. All our breads begin with a sourdough culture made of organic whole wheat. The bread’s total ingredients can be counted on one hand, not including the thumb: Flour. Water. Culture. Salt. C’est tout, ladies and gentlemen. Sound easy, doesn’t it? Well, halevai. The ingredients are only the beginning. Then it starts getting complicated. Kneading, shaping, rising and baking are all processes involving tiny, gentle nuances which demand our full attention. Each day we must spontaneously adjust the process according to time and temperature in order to produce a perfect loaf. True, we have learned to work with the variables at hand, but the most important lesson is that bread marches to its own drum. It may feel it’s too cold or too warm. Sometimes the air is too moist, while other times the aristocratic-natured Flour will simply not rise on time. Sometimes this is just because it can, or other times it loves frustrating us, but once the loaves come out of the oven, everyone at the bakery holds their breath. We lift a loaf, turn in around, inhale its aroma, compliment the color, check out the crust, tap its belly and listen to the sound that emits. In our attempt to offer the most uniform product possible, we have decided to try out a new type of flour. 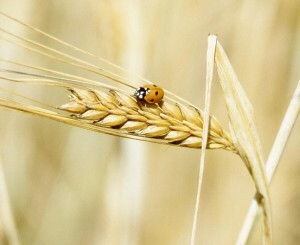 The organic seeds of grain are ground at the Kemach Ha’aretz mill. Last week, some of the loaves were made from the new flour, and this week all of them sport the new ingredient. We are beginning to get acquainted, adjusting the recipes to meet the new demands. Thus far, we are very pleased with the results. At first glance, 100% whole wheat bread looks darker. It also contains more bubbles, full of fragrance and a texture that allows both spreading and also pulling apart and dipping right into the spread. And the crust is delectable! The spelt bread is now just a tad taller than the previous type, making the slices nice and big. Its characteristic caramel color remains very similar to the earlier version. The rye bread is also a little more aerated. Well, “a little” is relative, for this is still a very condensed bread, and we still cannot slice it ahead of delivery because it is too sticky for the machine and crumbles inside. But hey, it’s hearty enough for your kitchen knife to slice, and highly recommended. In terms of nutritional value, the delicious rye contains more vitamins and minerals than the whole wheat loaves. In general, the new breads are lighter, with more bubbles on the inside. The culture is still the same – celebrating six years now – which Ido maintains, cultivating like the very devoted father he is. Those are the main changes we have seen thus far. We will be very happy, and actually request that you share your opinions with us: what did you like/dislike (whether we’re discussing bread or any other product.) You are the most important component of our enterprise, and it is crucial for us to hear from you. Orders may be made by email (chubeza@gmail.com) or SMS (054-6535980) until 1.4.19. The time has come to turn our attention to a permanent guest in your boxes that is usually taken for granted: the vivid cucumber. It certainly deserves some special attention, and there’s no time better than now to turn our eyes (and sink our teeth into) the cucumber than the days after Purim, thanks to this vegetable’s ability to tackle a hangover, among many other attributes. In the open field, cucumber plants spread out in all directions, similar to their aunt squash or cousins melon and watermelon. 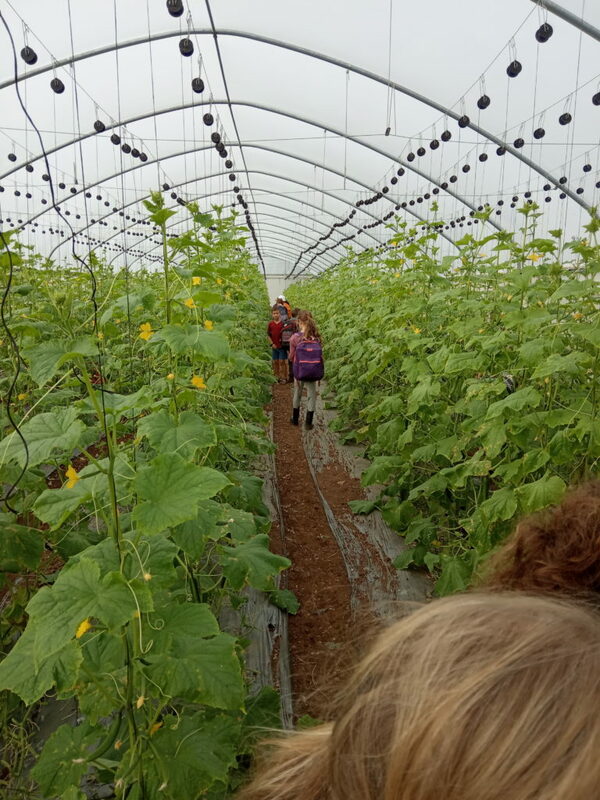 Within the greenhouse, the cucumber is grown by trellising – i.e., climbing on strong strings which stretch upward, allowing the cucumber to curl itself around them all by itself using its tendrils (curly stems growing from the leaf’s bottom). Thus, we can grow many plants in a way that allows for cross ventilation among the stems, while the cucumber can do its growing and climbing and yielding of beautiful, bountiful elongated fruit. The original cucumber is monoecious, meaning the male and female flowers grow on the same plant. The “traditional” summer cucumber species start by producing male flowers, which then are combined with female flowers to create bi-gender flowers, concluding with only female flowers. These cucumber species require pollination by pollinating insects that transfer the powder from the male to the female flowers. In breeding the species by crossbreeding and selection, new gynoecious hybrid cultivars were developed that produce almost all female blossoms which are parthenocarpic (virgin fruits, without fertilization or formation of “real” seeds). These varieties do not need to be fertilized, an act that might even hurt the quality of the fruit, which is why growing them in a greenhouse where they are isolated from pollinating insects is beneficial. Greenhouse cucumbers look somewhat different from the open-field varieties: they are smoother and more uniform in appearance, and they have round edges, as compared to the little point at the ends of the open-field cucumbers. There are also open-field cucumbers grown in Israel, but those are aimed mostly towards the “industry,” i.e., pickling. There are many varieties of cucumbers in the world, of course, other than the “Israeli” cucumber we discussed. 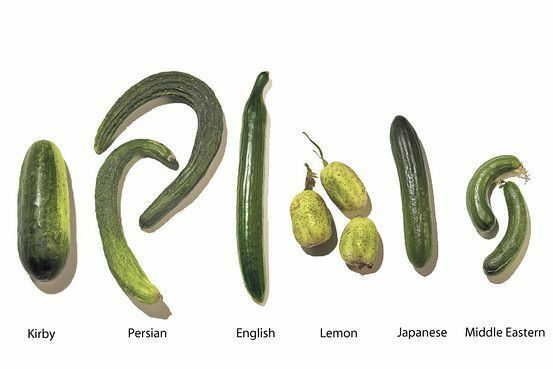 There are also huge greenhouse cucumbers, sold in Europe and the United States, individually Saran-wrapped, called “Dutch” “British” or “European.” There are the long, thin Asian species, and tiny white cucumbers. There is even a “lemon cucumber” which grows to be round and yellow. Its seeds are big, and its taste is a bit sour. People tend to peel the cucumber, but this is really unnecessary. 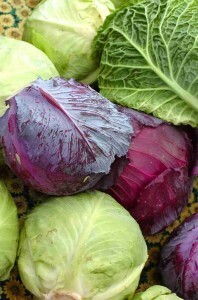 Basically, it is recommended to eat as many fruits and vegetables with their peeling intact, which adds dietary fibers to the food and slows down the release of sugar from the food into the blood (vital for those who suffer from such sugar problems as diabetes, Candida, fungus, sugar addiction, etc.). Also, leaving the peeling keeps the vitamins close at hand, especially the antioxidants. 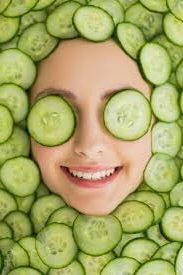 The cucumber is considered a cooler in Chinese medicine: a diuretic thirst-quenching vegetable that helps cleanse the body of toxins. It is considered to be a sweet vegetable that assists the digestive organs, rich in high-quality water (because plants purify their own water), containing calcium, potassium, beta carotene C and a trace of vitamin B.
in all honesty, even vegetable fussies are usually willing to take a bite out of cucumbers, which sometimes marks the beginning of a beautiful friendship! Scour our vegetable recipe section for many interesting, innovative cucumbers delights. Totally worth a peek! May we all enjoy a satiating, cleansing, and refreshing week, chockful of juice. WHAT’S JOINING THE CUCUMBERS IN THIS WEEK’S BOXES? Monday: Snow peas or garden peas, fresh garlic bunch, cabbage/cauliflower, potatoes, cucumbers, tomatoes, beets/baby radishes, onions/leeks, parsley root/celeriac, fresh fava beans, parsley/coriander/dill. Large box, in addition: Kohlrabi, carrots/fennel, lettuce/kale/chubeza (mallow)greens. FRUIT BOXES: Avocadoes, bananas, pomelit, clementinot. Wednesday: Snow peas or garden peas, fresh garlic bunch, cabbage/carrots, potatoes, cucumbers, tomatoes, beets/baby radishes, parsley root/celeriac, fresh fava beans, parsley/coriander/dill, lettuce/kale/chubeza (mallow)greens. Large box, in addition: Kohlrabi/zucchini, onions/leeks, fennel/peppers. FRUIT BOXES: Avocadoes, bananas, pomelit/pink grapefruit, clementinot. 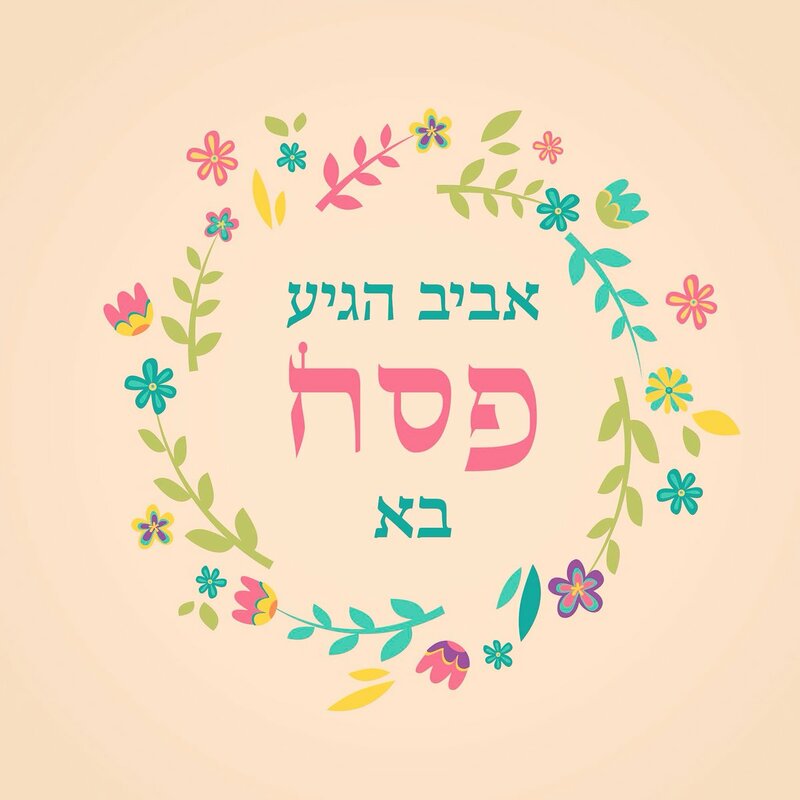 March 18th-19th-20th 2019 – Happy Purim! Spring is in the air, and Pesach is around the corner…..
You must know us by now… sometimes we like a touch of jest. So this week, in perfect step with Purim, we are beginning to add green garlic – a true masked vegetable – to your boxes. At first glance, this fresh green garlic may resemble a great big scallion, but its garlic aroma is unmistakable… Its bulb is bigger than a scallion’s (but not yet the size of a full-grown garlic bulb) and its leaves are long and flat, not hollow like the scallion. This is one of the last seasonal vegetables: it turns up in Israeli markets at the end of February, just when winter is beginning to ebb and spring glimmers here and there between wintry clouds. It remains only a short while, till the beginning of April. Green garlic is a unique vegetable, a childish, though not entirely infantile, gentle and innocent version of its pungent older brother, bringing to my mind – as a garlic lover– thoughts of the power of gentleness and tranquillity, of childhood and maturity. We have been growing green garlic in Chubeza since our very first season, where it made a debut in our first spring boxes. By now, it’s been with us for fifteen springs. Garlic is seeded in mid-September. We actually seed it by pushing garlic cloves into the earth. (You can do it yourself!) Even regular store-bought garlic can be used as a seed to spawn a new garlic bulb. Naturally, we use organic garlic cloves grown especially for this purpose, with the stronger and bigger cloves already selected for us, but also because the seeds are (supposed to be) free of pathogens (which is very hard to determine). The garlic shoots out a root, sprouts, settles nicely under the earth before winter, and then begins the wait. Just like the onion, its cousin from the Liliaceae family, the garlic waits patiently for its cue – the first signs of the days growing longer and also warmer after December 21– to begin to thicken and develop a bulb. 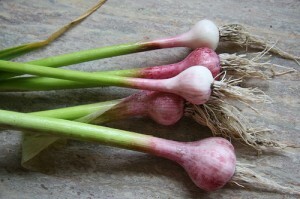 Despite garlic’s sterling reputation as an insect repellent (and rightfully so – insects do not really care for it), growing green garlic in the field is not a simple task. The garlic, whose leaves are erect and straight, needs our help in battling weeds, and garlic beds require constant weeding. 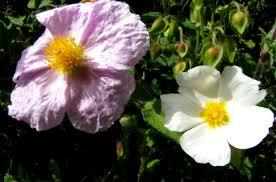 It is also vulnerable to various fungi and other diseases which may strike. Since fungi thrive on heat and moisture, over the past few warm winters the garlic crop became more and more difficult to grow. Even in a relatively dry winter, there is enough moisture in the air and earth for the fungus to develop, particularly when temperatures are not low enough to deter it. Thus for some years now, fungi have damaged our garlic crop by rotting out their roots and drying and yellowing their leaves. In organic (as well as conventional) agriculture, it is recommended to confront imminent threats to the garlic first and foremost by prevention: only plant garlic or other Liliaceaes in the same plot in five-year rounds, and use seeds from a reliable pathogen-clean source. There are also those who advise sterilizing the earth before seeding. In organic farming, this means solar disinfection: spreading clear plastic sheets over the ground, causing the earth to heat up to that temperature which kills the disease-causing elements, while still allowing the survival of microorganisms within the soil. 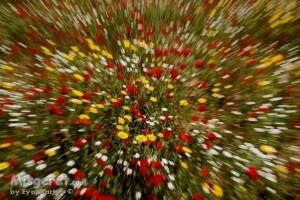 Above all, the most crucial requirement is to create and maintain a strong, fertile earth. Accordingly, at Chubeza we rotate our garlic plots in the field, and buy seeds from a reliable source. Several years ago, we also carried out a solar sterilization for the first time in various beds in the field, where we then planted the garlic (though we subsequently decided not to continue with this method). Naturally, cultivating the fertility of the earth is one of our ongoing tasks, and a strong, fertile earth proves itself able. The fungus usually strikes towards springtime, when temperatures rise. 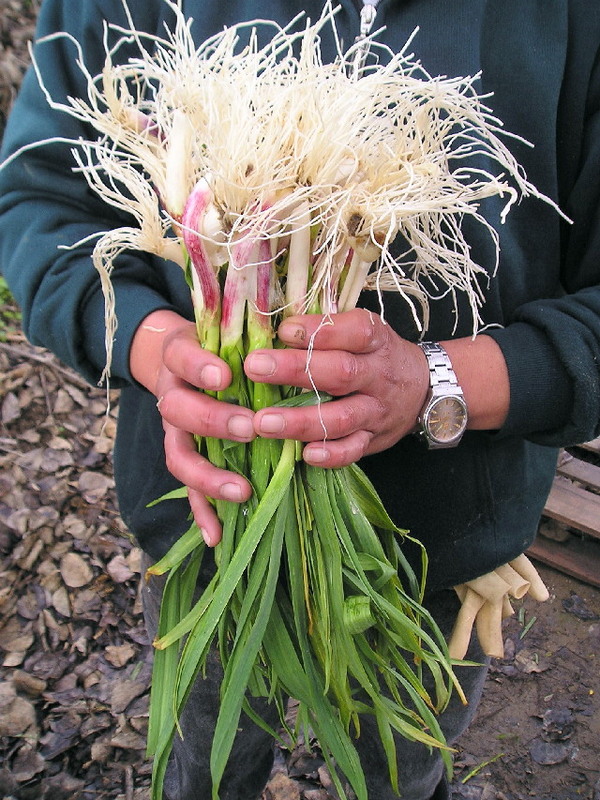 Thus picking green garlic at this time is, traditionally, our way to try to beat the system: once we detect signs of fungus-damage in a specific bed, we begin selectively picking the garlic in bundles for use as fresh garlic. The garlic that was not struck continues to grow in the bed, now enjoying a more spacious area underground to spread out. Once they hit maturity, we pick them and dry them in the sun (not direct sun, but under a blanket of leaves). This year, thankfully, most of our garlic yield is nice and damage-free, though one of our younger plots is looking a bit weak. We will be harvesting the green garlic for delivery over the next few weeks, mixing those from the younger plot and its older brother. The rest of the beds will wait, together with us, with throbbing hearts and a silent prayer, as they grow into impressive garlic bulbs which we will pick and dry. Green garlic is milder than dry garlic (which is more mature and becomes more concentrated, sharper and firmer in the drying process), and not as fetid. Use green garlic as you would a scallion. Its little white bulb is nice, but its long green leaves are tasty and quite useful – at least 6-15 cm of juicy leaves stretch from the bulb. Like leeks, the green garlic’s stem can trap some dirt within it, so it’s best to give it a nice rinse prior to use. The orange-brown speckles dotting the leaves are merely traces of the puccinia – a fungus that attacks garlic leaves. 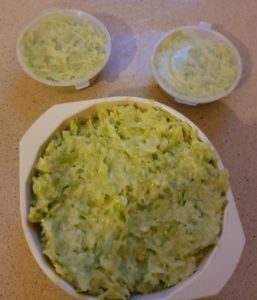 It is harmless for human beings and there is absolutely no problem using the garlic leaves, though if they are very contaminated, they may be best cooked rather than fresh in a salad. Store fresh garlic greens in your refrigerator for three to four days. After you have used the greens, you may store the garlic bulbs in a ventilated basket in the kitchen, without refrigeration. Green garlic can be added to salads, omelettes, sauces, baked goods and dough, made into a spread, grilled, blanched, sautéed in olive oil, or any other use you can think of. Its mild taste makes it a super candidate for garlic soup. Check out our recipe section for a host of wonderful ways to use fresh green garlic. 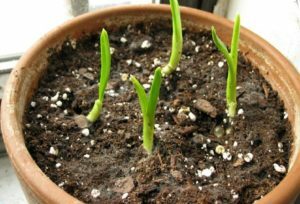 And what’s really nice is that garlic can easily grow as a plant outside your window: stick a garlic clove in the earth, water it and give it time. It will reward you by sprouting beautiful greens for you to chop and add to any dish that is enhanced by yummy, mild garlic. Alongside the sadness and pain that began this week, we hope you manage to find happiness and smiles for the month of Adar and Purim. Large box, in addition: Beets, kale/chubeza (mallow)greens, leeks/fresh garlic, fennel/kohlrabi/bell peppers. FRUIT BOXES: Clementinot, bananas, pomelit, avocadoes. FRUIT BOXES: Clementinot, bananas, pomelit/red grapefruit, avocadoes.